Sweet on someone? Send them a sweet potato gram! Want to brighten up someone's day? Send a sweet potato gram. This is a fun twist on our popular Potato Gram and, let's face it, just about everyone loves sweet potatoes. They're the sweet potato of the potato world. Literally. We pick a real, fresh, U.S. grown sweet potato (currently from the great state of North Carolina) and hand-write your personal message on it. We wrap it in gift tissue wrap paper and send it, anonymously, anywhere in the U.S. The only way they will know it's from you when they open it is if you include it in your message or card. Want them to know it's from you right away? No prob, just choose that option below and your address is used as the return address. Our Sweet Potato Gram is fun and a guaranteed attention getter. It's the most memorable thing they'll get all year. Seriously, they will never forget getting this in the mail. I yam so proud of you! You're as sweet as this potato! This is sweet and so are you. I yam in luv with you. Sweet Potato! That's a lot of Glitter! *Note: This item ships to U.S. Destinations only. Item may contain branding message (ie: small flyer). Let us know if you want this removed. What message do you want written on the sweet potato? Add a nice note card, a 5×7 greeting card, or an official Glitter Bomb Card rigged with colorful glitter that pops out when opened (normally $9.50). Cards will include your message hand-written inside. 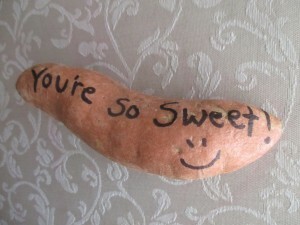 If you’re adding a card to your awesome sweet potato, then add your message here. Have something special you would like us to do to your sweet potato or card? Draw a heart, smiley or something? Just let us know right here! Do you want us to wrap your custom sweet potato in premium gift wrap along with a bunch of sparkling glitter so that it creates a colorful mess when opened? If so, choose this option. You can also opt for the easier to clean up glitter. Choose some of these fun additions to your Funky Delivery! These items can be added to the package or inside the card (whichever is most appropriate for the item). If you choose to ship it anonymously, we will use one of our unlisted U.S. mailing addresses. We will not include any information about you inside or outside the package. It’s a mystery! Upgrade to USPS Priority Mail Shipping (1-3 days).